Chilling Adventures of Sabrina season 1 episode 2 picks up with Faustus answering Sabrina’s questions about her Dark Baptism, as invited by Sabrina’s aunts in the previous episode. Faustus says that the ritual is mostly symbolic and downplays the seriousness of the sacrament. Sabrina, however, is very serious about what is being asked of her, particularly as it relates to her relations with the mortal world. Faustus says that the Dark Lord is not evil, he’s the embodiment of free will. If Sabrina undergoes the Dark Baptism and gives witch life a try, she has the free will to recant later. With the big day looming, Sabrina gets a taste of the witch life. When the football players continue to harass Susie, Sabrina turns to the Weird Sisters for help getting back at the boys. Sabrina and the sisters lead the boys into a mineshaft, where Sabrina plans to embarrass and blackmail them. The sisters, on the other hand, have their own plans to terrorize the mortals. If Sabrina is so worried about the affairs of mortals, the sisters ask, why doesn’t she just remain with them? Hilda and Zee depart to make preparations for the ritual, leaving Sabrina home with Ambrose. Ambrose tells Sabrina that if she goes through with the Dark Baptism, there won’t be any going back to her mortal friends. A veil will separate them, and it would be best for Sabrina to forget them than to live with the pain of watching them grow old and die. Craving one last night with her friends, Sabrina attends a Halloween party at Roz’s house with Harvey and their friends. Sabrina hopes that Harvey won’t forget her when she’s gone, but also hopes that he can forgive her. When the party moves outside to watch the eclipse, Sabrina takes off to the woods for her Dark Baptism. Sabrina is hesitant, but prepared to go through with her unholy vows. Faustus officiates the ceremony, but rather than being a mild formality as he earlier suggested, the full impact of what she’s about to do weighs on Sabrina. Sabrina sees another vision of her parents, with her mother telling Sabrina to run away. Faustus and the coven follow Sabrina back to Spellman Mortuary, where Ambrose bluffs that a protection spell surrounds the house and drives the coven away. Sabrina has chosen neither the Path of Night nor the Path of Light. Or, as she sees it, she’s chosen both for at least a little while longer, in spite of how Zee claims that Sabrina embarrassed her and disgraced the Spellman name. 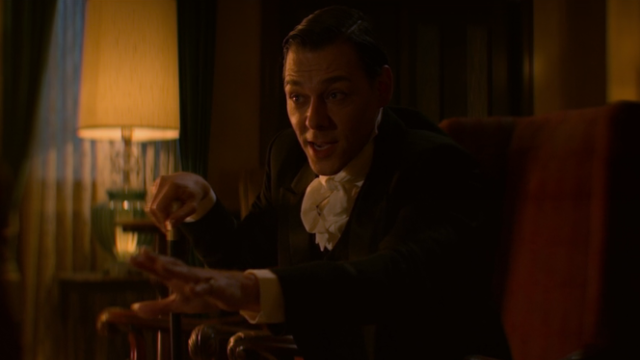 Wardwell calls out to the Dark Lord, pleading for mercy that she doesn’t deserve after failing to deliver Sabrina to him. Back at school, Sabrina is summoned to the principal’s office, where the Dark Lord possesses Hawthorne and warns Sabrina to either sign her name in his book or wish that she had after he is done with her. 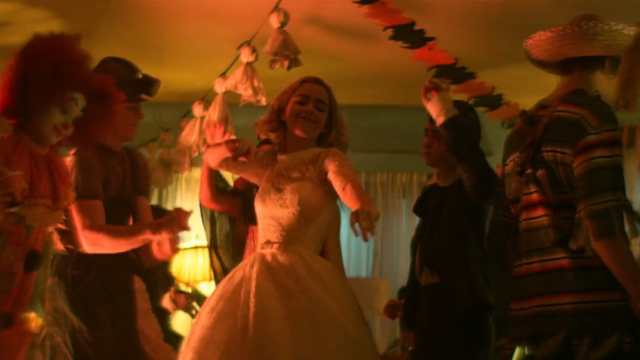 What did you think about Chilling Adventures of Sabrina season 1 episode 2? Let us know in the comments below! The post Chilling Adventures of Sabrina Season 1 Episode 2 Recap appeared first on ComingSoon.net.